Israeli police have reopened a key Jerusalem holy site after its closure amid tensions following the shooting of a prominent right-wing Jewish activist. The Temple Mount/al-Haram al-Sharif was reopened ahead of Muslim Friday prayers, but with restrictions on worshippers as a security measure. Sporadic violence broke out in East Jerusalem and the West Bank but there have been no major clashes so far. On Thursday, a spokesman for Palestinian leader Mahmoud Abbas described Israel's temporary closure of the holy site as a "declaration of war". The compound - known to Jews as the Temple Mount and to Muslims as al-Haram al-Sharif - is the holiest site in Judaism, and contains the al-Aqsa Mosque - the third holiest site in Islam. The site was reopened to Muslim worshippers on Friday morning, with entry to men restricted to those over 50 amid fears of unrest after Friday prayers. Israel deployed more than 1,000 security personnel around the Old City as it reopened the holy site on Friday morning. Small groups of Muslim men made their way through checkpoints to the site. After Friday prayers, there were reports of clashes at the Qalandiya checkpoint near the West Bank town of Ramallah as police fired tear gas on stone-throwing Palestinian youths. Israel's Haaretz newspaper also reported stone-throwers being dispersed in the East Jerusalem district of Wadi Joz. There were no immediate reports of injury or arrest but tensions remained high. 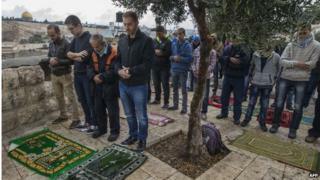 On Fridays, the holy day of Islam, prayers are often a time of heightened sensitivity - especially since this latest escalation of tension surrounds the familiar dispute about the rights to worship at a site around the al-Aqsa mosque in Jerusalem's Old City sacred in both Islam and Judaism. A delicate status quo governs rights of access to al-Haram al-Sharif/Temple Mount. Israel captured the Old City in 1967 but swiftly handed control of the compound back to the Islamic religious authorities, fearful of triggering a Holy War. Israel's security forces do impose restrictions - banning men under the age of 50 from worshipping on occasion - but argue that is about maintaining order. Jews are allowed to visit the site but not to pray there. Now some right-wing religious groups say Jews should be allowed to pray - a demand which causes anger and unease in the Muslim world. If it all sounds familiar - well, that is because it is. When Britain governed the Holy Land in 1929 a very similar dispute provoked rioting that led to widespread loss of life - a proper resolution of it all still feels hopelessly distant. On Thursday night hundreds of people gathered for the funeral of Moataz Hejazi, the Palestinian suspected of wounding Rabbi Yehuda Glick, amid a heavy police presence. The burial passed off without incident, police said. Mr Hejazi, 32, was shot after opening fire when police surrounded his home, officials said. Rabbi Glick is a well-known campaigner for the right of Jews to pray at the site, which is currently prohibited. Mr Hejazi's cousin alleges that he was shot by police after being detained within his house. Israeli police say Mr Hejazi was killed after he began shooting at police who then opened fire in response. A Jewish baby and Ecuadorian woman were killed when a Palestinian attacker drove his car into a group of pedestrians in Jerusalem last week.